Dmm: Who and what have been your inspirations in dance and in life? Cecile: Tons of dancers would answer the same: Michael Jackson! Then music videos of the 90’s wouldn’t let me go to sleep without dancing my sweat off. Later, I started training at a dance conservatory where I discovered how much I loved the pureness of modern dance. My inspiration for Skate Dance is Tayaran Robinson, a Skate Dance legend I met in London when I was 18. He was the revelation for my Skate Dance career. I loved dance. I loved skating. I had to dance on skates. Dmm: Was your family supportive of your choice to dance? Cecile: My dad was always. He was there at most of my performances and helped me finance all of my dance training. Dmm: How did you develop your craft over the years? Cecile: When I returned from London to Paris I created my Own Skate Dance Company: The Miss’iles. With the Miss’iles I trained dancers to perform on skates, created all the choreography and costumes and performed at events. However, I still needed some serious dance training; I applied for the Alvin Ailey Certificate Program and got accepted! Dmm: What have been some hardships you encountered while pursuing your craft? Cecile: The 3 years of the Alvin Ailey dance training program was the most beautiful experience and the best training I could have ever dreamed of, but it was the hardest time too. It was my first time traveling overseas and living by myself. I had no friends or family around and money was very scarce. The training was so exhausting that finding a job on the side was nearly impossible. Babysitting was all I could do to get money to pay my rent. I lived in a tiny room in East Harlem and I had just enough money left to eat dollar store food. But the New York struggle is a great Life School ;). Dmm: What have been some of your most memorable moments with dance thus far? Cecile: Every dance performance is a memorable moment! The Alvin Ailey Certificate Final Performance was amazing. I had the opportunity to show my creations at the Alvin Ailey Theater and got my Alvin Ailey Certificate. Then, I performed in Noddy the Musical and we go on tour every year in France and other countries. I performed at The Diwali Times Square Festival and also another memorable performance was Bollywood Dreams The Musical. Tickets were sold out; that show was epic! And every time I perform Skate Dance with my team, The Miss’iles, we have a blast. We are sometimes booked abroad. It’s fun to travel with your team. I get to perform in great music videos too, like Avicii You Make Me. Dmm: How are you using your gifts to give back to the community? Cecile: I teach dance and skating in NYC public schools. I teach Skate Dance for skaters or dancers in Paris and New York. 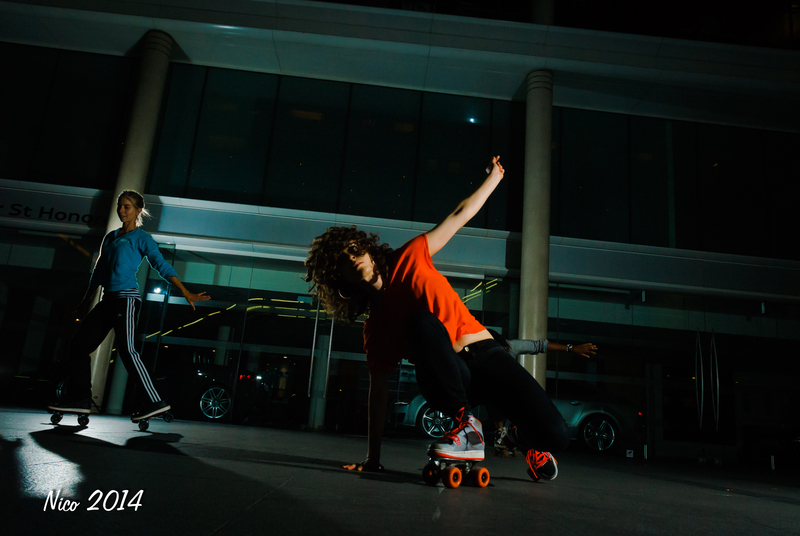 I also create street modern dance pieces and Skate Dance shows for different kinds of events. Dmm: What advice do you have for the next generation of dancers? Cecile: Being versatile is the key. You can’t just stick to one type of training if you want to be a complete dancer. You do have to eat a little bit of everything, but you should still master one specialty. Dmm: What do you have planned for 2015? Cecile: I’m flying to France for the first French edition of the Got to Dance talent show. I got invited to perform with my Skate Dance team. I just finished creating an hour long show about the history of Skate Dance that I am starting to promote. Besides that I am still working with different modern dance, Hip Hop and Bollywood companies for upcoming performances in New York. Dmm: Where do you see yourself 10 years from now within the arts? Cecile: I want to be busy dancing for companies worldwide. I compose music and I always wanted to create a whole ballet choreography with all my piano works. I must find the time to accomplish this. As for Skate Dance, I’d like to develop it more, choreograph and perform for more big artists or have my show booked worldwide! Dmm: Is there anyone you want to thank for helping you on your journey? Cecile: My dad and my brother are my precious closest family: My dad for his support, my brother for his great advice. Tayaran Robinson who inspired me and changed my life. RIP. The Miss’iles, especially Ines & Mandy, the main company members that always stick with me no matter how crazy are the situations that I put us into.